Firefox 3 Final Finally Out! 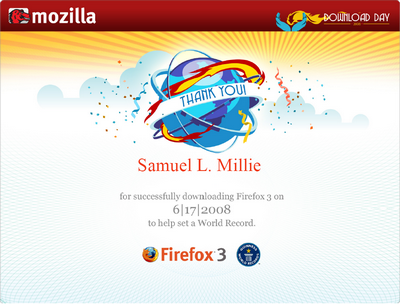 Firefox 3 final has finally landed. It is used to compose this article. Hurray! You can download it directly above and/or wait to make the world record together in a few hours at the Download Day 2008 home page. Either way, enjoy the BEST browser in history, and let's make history. Update: Don't forget to get your certificate after downloading!